Click the "GO: button for “ServiceEngage Point of Sale Materials”. 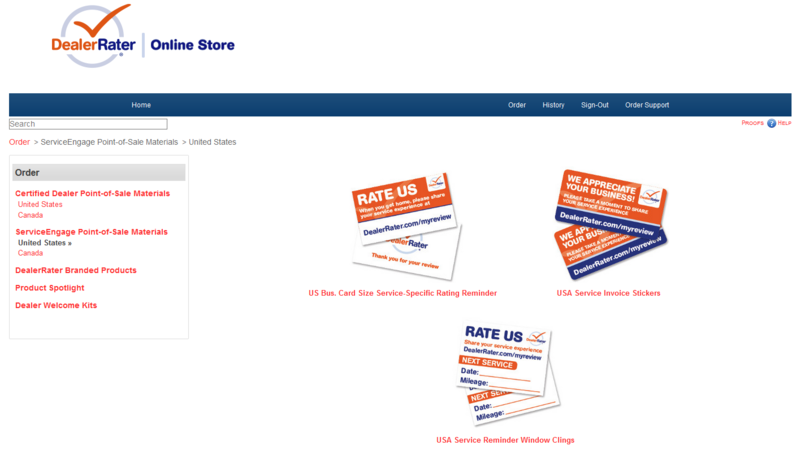 You can also order general Certified Dealer Rating Reminder Cards and Window Stickers at no cost by selecting the “Certified Dealer Point of Sale Materials” category. Click the item you wish to order. Enter your Shipping Address, and if needed your billing address, and click “Continue”. Click “Continue" to review your order. Click "Place Order" to submit your order. Once your order has been submitted, you should receive your materials. If you have any further questions, please don't hesitate to contact DealerRater Support.